Hmm shame you can still see the Dot through the grill, might have been better off with a layer of black lady’s tights/pantyhose to disguise it slightly better. The light ring would still show through, and mic performance shouldn’t be any worse. I like the idea of hiding Dots as they’re not the nicest things to look at really. Was going to say exactly this, other than the fact you can see the buttons this is beautiful! Little bit of speaker grille material would have really wrapped this one up nicely. Nice job; the idea above about adding some fabric to hide the buttons is a good one, though, and easy to implement. Also, since you’re putting it in a nice big box, it seems a good opportunity to throw an amp and speaker or two in there, get some better sound out of it. The rubbery bottom of the Dot peels off with a bit of work. After I got rid of that, a piece of Velcro stuck to it just fine. I used it to mount a dot under a kitchen wall cabinet. This build is great, just needs that speaker fabric. Just curious, do you use a cellphone? Does it have Siri, Cortana, Google Assistant or Alexa? Does it have GPS? Internet? If the answer is yes for most of them, then I can’t how different is that from a device such Echo. Great idea, and nice build. It would be cool to pair this inspired case with some sort of retro video display, with a suitable ‘talking’ video avatar (think Max Headroom or Big Brother). And then it cannot understand you correctly from anywhere anymore. I think it should have been mounted in a sound proof faraday enclosure. Just wrap the whole enclosure in tin foil (available from a discarded hat). It’s so 1948, fitting for the decor of 1984. Hiding one in the kitchen, whoa. When these become tiny and ubiquitous we will have a problem for sure. I saw an icon on one with a symbol of a ribbon microphone with a slash thru (off). A hammer would be trusted but not that button. 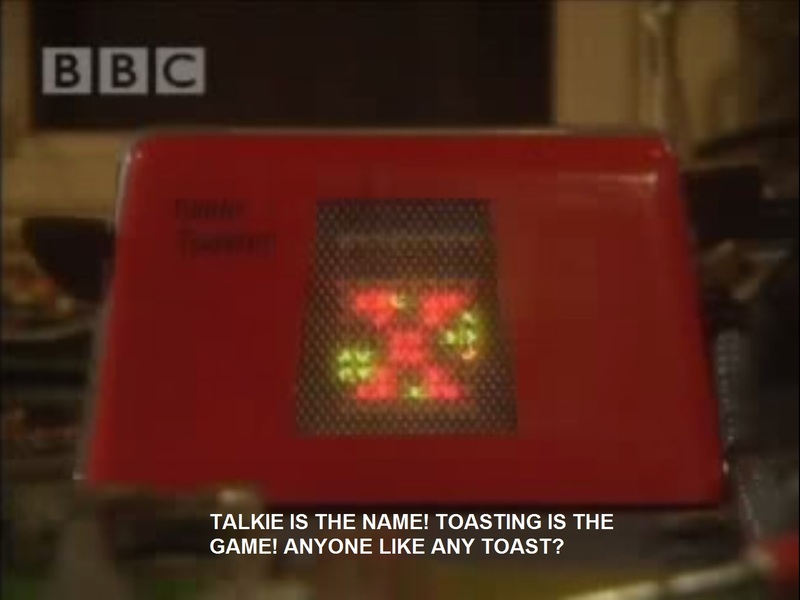 Oh come on someone, do a “Talkie Toaster”! Vertical orientation probably messes up the ability of mics to filter out ambient noise. I’m guessing here, but it seems likely that the echodot uses the “Alexa” command to read microphone parameters that then allow it to focus on location of the sound source.